La-Mulana 2 on the Playism Store | Bringing a different breed of indie game to the world. Explore the dangerous ruins of Eg-Lana with Lumisa Kosugi in La-Mulana 2. LA-MULANA 2 features sprawling ancient ruins, mind-boggling mysteries, untold numbers of items, and terrible enemies woven together to form what is possibly the perfect Metroidvania-style "archaeological ruin exploration action game". Explore the vast ruins comprising multiple field maps, solve mysteries and riddles using the stone tablets and messages you discover along the way, and take out the huge monsters known as "Guardians" as you make your way to the deepest depths of the ruins. A classic experience: As with its predecessor, La-Mulana 2 will not feature a tutorial or a long-winded sidekick. As a seasoned explorer, it's up to you to discover the secrets hidden within the ruins and find the truth within on your own. I am a Kickstarter backer, and I haven't received my reward. All Kickstarter emails were sent out on July 27th. Please check your Spam and Promotions folders to see if your email landed there. If you cannot locate your email, please email support[at]playism.jp and let them know that you can't find it anywhere (including spam). I am a Playism backer, and I haven't received my reward/didn't get an email. Playism backers had their rewards automatically generate in their Playism libraries. Please check the Add-Ons section of your Playism Library to get your reward. I only have the game, where are the rest of my rewards? With all the focus on getting the game released, some rewards are not ready yet. We will be releasing the other rewards as they become available. I want my DRM-Free version! For Playism backers, this should already be in your account. For Kickstarter backers, email us at support[at]playism.jp from the email you use on Kickstarter, and we will add it to your Playism Account. When will the Physical Rewards be ready? Will you contact me? The physical rewards aren’t ready yet, and we can’t say when they will be yet. We WILL contact you when we need info from you though! Where is my Steam key in Playism? Please click on the “Download” button in your Game Library. Your key should appear then. We haven’t collected any shipping addresses since the physical rewards are not ready to be sent. We WILL contact you for your shipping address when those rewards are ready. I made a Playism Account, why is my Kickstarter reward not automatically appearing there? I'm afraid that this is not automatic. All Kickstarter rewards are emailed out. If you would like your DRM-free copy, you have to email Playism and ask them for it. We are handling these manually because there is no automatic system in place. I'm afraid that Kickstarter and Playism backers are only entitled to the PC version of the game. We have been listing that very clearly on the Kickstarter and Playism pages since day one. We have been working really hard to get all the rewards that were promised to backers to the backers, and are working to get the currently unavailable rewards ready. These rewards do not include the console versions, as the stretch goal was not achieved. We thank you for your understanding. Where is my copy of the OST? Is there a manual for the game? Can I rebind my keys? Yes, you can. Please note that the rebinding options span over two different pages. If you have a duplicate on the two menus, you will run into errors. I'm suffering from game slowdowns / lag / low framerate / etc. We have worked hard to get the game to run as smoothly as possible, including areas that are pretty demanding. Please check your PC specs, your CPU strength is pretty important for this game, so if you are on the line with minimum specs, we can't guarantee it will run as smoothly as desired. I have an 8-core processor. Turns out, if I only allow the game to run on 2-4 cores, it runs flawlessly. 1 core isn't enough processing power, so it has traditional frame drops, choppy music, etc. 2 seems to be the most stable. 3-4 are mostly good but experience a few sluggish moments. 5-8 are all pretty laggy. I don't know if this is a problem with the game or a problem with my computer/processor, but it solved my problem, and it may solve yours. To change the amount of cores you're using, open up the task manager (Ctrl+shift+esc), click "More Details" if not expanded, then click the "Details" tab, right-click LaMulana2.exe, then click "set affinity". My Xbox Controller doesn't work on Mac. Sadly due to Apple and Microsoft not supporting each other, we are unable to easily address this. Our best suggestion is to use a 3rd party mapping tool. Have you tried using Steam to configure your controller? I want Pixel Perfect Scaling/more screen resolutions/etc. This game designed "looks like Pixel-perfect" when you choose 960 * 540 resolution. But it's actually made with Unity which is 3D engine, so all pixel arts are technically 3D object and some effects are using real-time rendering. Full screen setting may cause blurry edges. We recommend 1920 * 1080 or 960 * 540 resolution if you want near pixel-perfect scale. This could be happening for a variety of reasons. Can you please try configuring your controller via Steam. Steam settings > Controller > General controller settings and enabling Playstation configuration support. Open keyconfig.xml in notepad and set all elements which fall between < joyname1 > < / joyname1 > to null. Map all your controller inputs to their appropriate keyboard inputs in Xpadder. Did I suddenly turn on hard mode without reading the tablet? The game will get more difficult the more you progress through it. Great, send us an email at support[at]playism.jp. Please make sure you email us from a verifiable email address. Does buying La-Mulana 2 on Playism change anything? No, the build on Playism is the same as on Steam. The only difference is that with Playism, you get both the DRM-Free version and a Steam key. 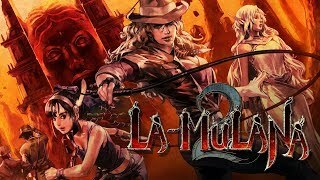 What do you think about La-Mulana 2? This game studio was established in Japan in 2007 by a group of friends who had previously been working on games as a hobby. Free Flash games are available to play at the NIGORO website (http://nigoro.jp/), where other games are also distributed. Development is undertaken by a three-person team, consisting of two programmers and one director/graphic artist. Their catalog of outstanding works in the Flash game arena contain games such as “Rose & Camellia”, “Mekuri Master”, and “LA-MULANA” - which gained a large following back in their amateur days and was later remade for WiiWare, and then ported to the PC.